The Load Support is a product designed for the tranportation industry. 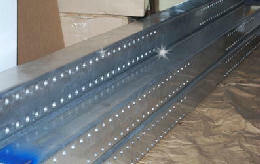 Used on flatbed trailers to haul such items as steel pipe, large tanks, machinery, etc. It prevents the pipe or other cargo from rolling/falling off the deck while loading/unloading and can be used between the load levels as the load is piled on the trailer in tiers. The product is made to have a four inch clearance between cargo and deck or other loaded cargo as to allow fork lift clearance. It also has wedge blocks on both ends with a flat end on the other side of wedge block. The wedge block can be used on the underside of unit as well to keep the Load Support in place. The wedge block, (once turned around to allow flat edge to face cargo), can be used to hold cargo steady on trailer. Load Supports can help reduce load shift, falling cargo, property damage and personal injury or death due to falling cargo.